Needing a win or a tie to clinch a home game in Sunday’s ODAC Tournament Quarterfinals, the EMU soccer men are left sitting in purgatory for a day. The Royals dropped a 3-0 decision at Washington and Lee on Tuesday, with all of the goals coming on second chances in the final 25 minutes. The men still sit in fourth place in the ODAC standings while W&L locked up the top seed in the upcoming tourney. Attention now turns to the final games around the ODAC, which are Wednesday night. EMU (9-8-1/6-4-0 ODAC) holds a three-point lead over both Roanoke and Ferrum. 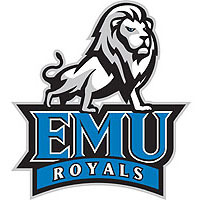 Roanoke, who hosts third-place Bridgewater, owns tiebreakers over both EMU and Ferrum, and with a win could supplant the Royals in fourth place for the final quarterfinal home game. That leaves the men essentially rooting for their rival Eagles. The Panthers play at Randolph, although EMU holds the tiebreaker over Ferrum and cannot be jumped by FC in the standings. Tough defense and a great effort from keeper Emmanuel Kampanga (Kinshasa, Congo/American School) kept Eastern Mennonite locked in a scoreless chess match with Washington and Lee (11-3-1/9-0-1 ODAC) throughout the first half. Kampanga made his first save just 3:55 into play and had five by halftime. Led by Caleb Oakes (Waynesboro, Va./Stuarts Draft), the offense started to put some pressure on the Generals in the second half. Finally, in the 66th minute, W&L broke through when Viktor Dolberg put in a rebounded shot after Kampanga had originally made a diving save. The Royals came close to equalizing in the 80th minute, but Emmanuel Boamah‘s (Alexandria, Va./West Potomac) header off a corner was blocked. Less than two minutes later, the Generals closed the door when George Biddle put in another second chance attempt. The men earned a pair of corners and took four shots over the next four minutes before W&L got a third putback goal off the leg of Dylan Ritch in the final minute. Kampanga finished with six saves. Oakes fired three shots, including both of EMU’s shots on goal.